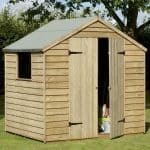 Compared to similar competitor sheds, this wide spacious offering from Shed Store stands out in terms of quality. Overlap cladding gives it a lightweight and reliable style, though it will need to be annually treated to fulfil its 10 year anti-rot guarantee. One main difference of this shed is its braced, wide door. You’ll notice the ‘Z’ bracing on the interior of the door helps to make it much more rigid than standard unbraced doors. This is an excellent feature to be found on overlap buildings and shows that the manufacturer cares about its quality. A fairly big rectangular fixed styrene window is included at the front of the building. Sadly this cannot be covered with a blind or curtains as the cladding is too weak. However, providing you add good security to the shed, this shouldn’t pose a problem. A pent roof offers great rainwater protection, along with height restriction benefits. Apex roofs are the most common choice, though they aren’t a good choice for those looking to install the shed in a height restricted area. 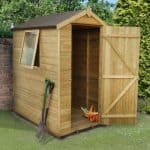 This shed still has a tall design, but its sloping feature is what helps you to erect it in front of fences or underneath low hanging objects such as trees. Weak floor could be a problem, but will easily accommodate lightweight storage. The Windsor Overlap Pent Shed is a very basic, storage solution. Offering a good amount of width, it does benefit from a tall, deceptively spacious design. Pent sheds aren’t often known for their height as they are largely designed to fit into areas where apex sheds won’t. The front height of 6’9” is incredible and allows even the tallest of people to walk around with ease. The door has a standard height, though in width it is superior to many of its competitors. So if you’re looking for a simple storage shed that is comfortable to use, this is a great option. With the exterior walls manufactured with overlap cladding, it’s not a shock to see the interior of the shed is made from solid sheet board. This has a very rough, unappealing look but it does offer a reliable and affordable support. As you can see slightly from the picture, the pent roof slopes downwards towards the rear. This means you can erect it in front of a fence or bushes without compromising interior height. Shed Store provide a fairly cheap felt to cover and protect the roof, though it isn’t exactly built to last. For that reason we recommend buying a better quality felt elsewhere and discarding the felt you are supplied with. 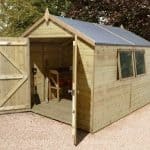 The floor isn’t overly rigid so we’d also advise you to either spend a little money upgrading it or stick to using the shed for lightweight storage. 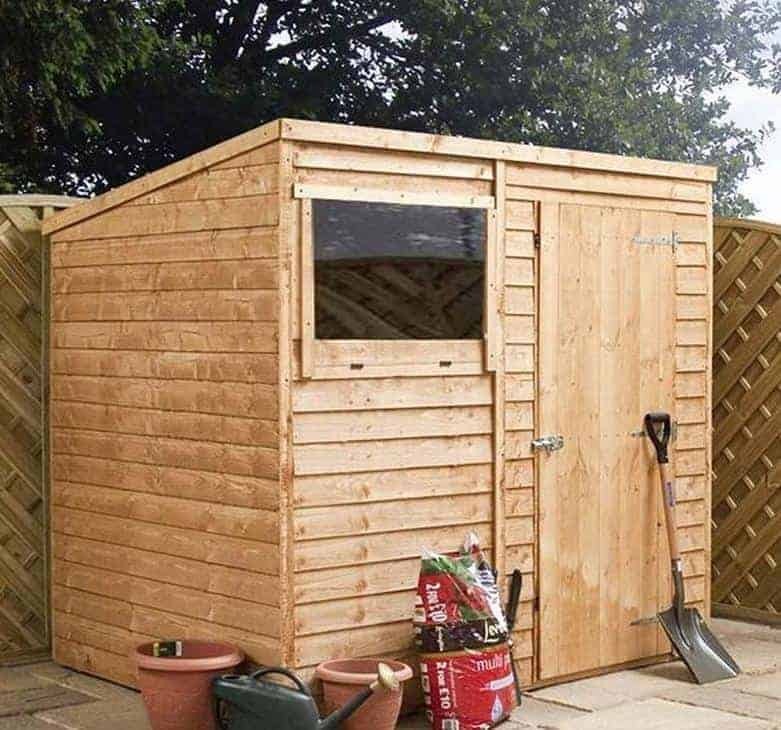 Shed Store do not offer any upgrade options so you would need to upgrade it yourself which will obviously require some DIY skills. One thing the manufacturer does that many others don’t, is pressure treat the floor joists. So compared to a lot of competitor sheds with a solid sheet board floor, this is slightly sturdier. Traditional square cut overlap is used on the exterior walls. Many people don’t realise there is more than one type of overlap. The square cut version is the highest quality, though it is still prone to warp so you need to be careful where you erect it. If it is built in an area of the garden that gets a lot of strong sunlight, the wood could discolour. You could use a spirit based treatment to reduce the likelihood of this happening however as it forms a strong external and internal weatherproof barrier. 28mmx28mm framing is used to support the interior of the walls and it does come with a 10 year anti-rot warranty. However, to benefit from this you do need to make sure you treat the shed properly with a very good quality preservative. It will need to be treated after assembly and yearly after that. The braced, wide single door is one of the focal points of this shed. It’s surprising to see such a well-made door included on an overlap building. It isn’t very heavy, but its width is super-impressive; allowing you to get into the shed with ease, as well as enabling easier transportation of bulky storage. There’s a pad bolt included so you can make sure the door won’t open by itself. The pad bolt isn’t going to stop anybody gaining access to the shed and the overlap cladding isn’t very strong. 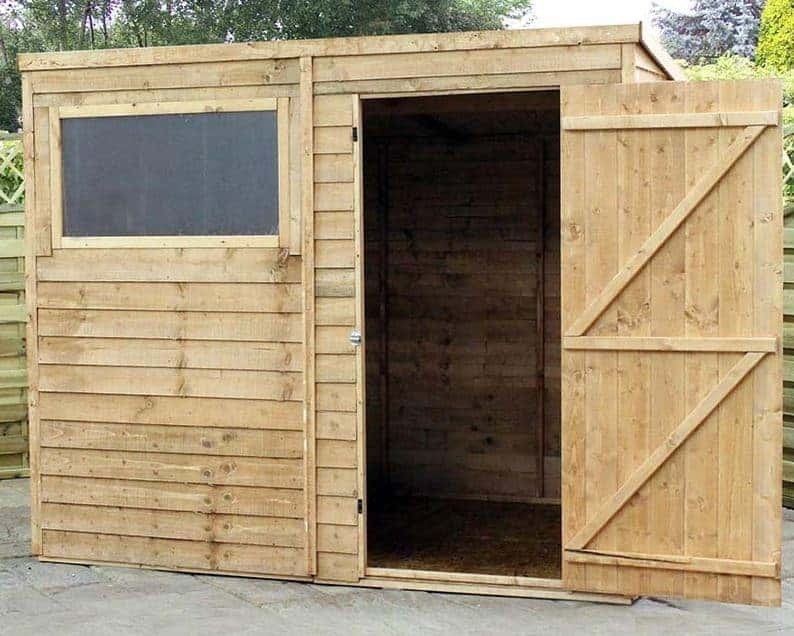 Therefore this isn’t exactly the most secure shed on the market. You can improve this by investing in a padlock. However, due to the weakness of the overlap, it is always going to be less secure than a tongue and groove clad shed. As it comes with a pretty big window, it also isn’t going to be very private. 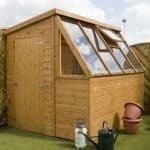 For this reason we would advise against keeping anything expensive in the shed and it would be a much better model for those who have a very secure garden. A Portabase DIY Timber Base Kit is available as an extra and we’d recommend investing in it if you don’t have a concrete base to build the shed on top of. Without a stable base, the shed could end up with stability issues. This base is incredibly strong and has been pressure treated to last 10 years. It even comes complete with ground spikes to ensure the base is firmly anchored into the ground. A number of coloured treatments are also offered, though the shed is supplied with a tub of free treatment. However it is worth looking at the different treatments on offer as you could find you prefer the Red Cedar or Ivy Green colours. All are 100% safe to use and are particularly great for applying to overlap buildings. The least essential extra is the DIY Assembly Assistance Tool Kit. Packed full of tools that could be used for years to come, this is a worthwhile investment. A hammer, safety goggles, brushes, screwdriver and 16 inch saw are just some of the great tools included in the kit. The shed does benefit from a good quality design considering its cost, but it isn’t as strong or as stable as tongue and groove. It is largely built for value, rather than exceptional quality. Though not as strong as Shiplap or tongue and groove, with the right maintenance this shed should still last 10 years. That’s pretty good longevity considering its budget price. The fact the shed is wide with a short depth means you are slightly restricted in terms of what you can store. The weak solid sheet floor also limits what the shed can hold. There is more than enough space to store bicycles, a light wheelbarrow and basic bits and bobs however. The majority of people find this shed easy to build. The instructions are easy to understand and the installation itself doesn’t take very long. The only thing you may struggle with is the roof. In particular, the tacks for the roofing felt are noted as being a little on the short side which makes it slightly more difficult to install. 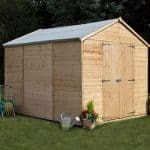 This is one of the more popular sheds available due to the amount of storage and incredibly low cost. Despite the annual treatments needed, this shed does offer pretty decent value for money. Final Thoughts: Overlap sheds aren’t known for their exceptional quality, but you’ll be surprised with this one. It comes with a few great benefits including a braced door, long fixed styrene glazed window and a free tub of treatment. One of its most redeeming features is the fact it is very easy to assemble. You may experience a few niggles, but overall this is one of the easier sheds to install. Just remember that this isn’t designed with heavyweight storage in mind. It also does not come with much security so you may want to invest in a good alarm system if you live in a vulnerable area.